There's bad news and good news in a new analysis of the ad industry published this morning by GroupM's Business Intelligence unit. 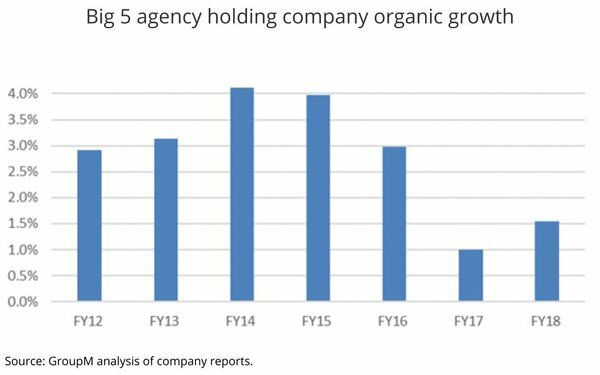 The bad news is that organic growth of the major agency holding companies appears to be contracting: expanding only 2.1% in 2018, a quadrennial year following 2017, which grew only 1.0%. The good news, according to the analysis by GroupM Global President-Business Intelligence Brian Wieser, belies other strong indicators of underlying health for ad agencies. "It may be difficult to reduce spending by much more if they intend to produce and execute on a similar volume of work as in the past," Wieser explains in the report, entitled "A Basis For Optimism," adding: "To the extent that those marketers may have cut their spending too much and are set to rebound, and presuming that agencies continue to find ways to help their clients in their marketing efforts, the data here can provide a basis for anticipating an ongoing recovery and a resumption of more normalized growth." An even more optimistic view comes from Wieser's expansion of the ad agency business to include digital services divisions of the five largest consulting and/or IT services firms focused on advertising. 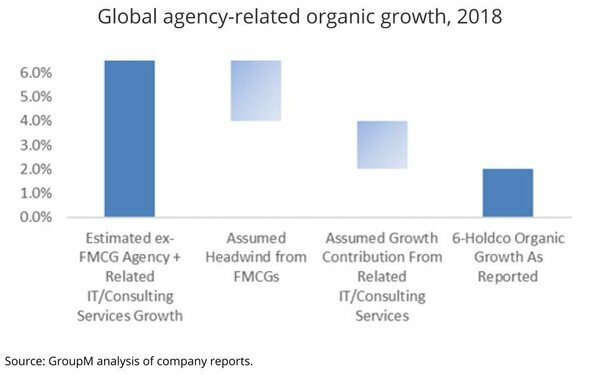 "We can estimate that there are around 83,000 worldwide employees focused on digital/interactive and agency services at this group of companies," Wieser notes, adding: "This total could be added to the ~419,000 who work at the six largest 'traditional' agency holding companies." Wieser estimates that incremental category expanded around 10.0%, which would mean the more broadly defined agency sector expanded around 4.0% in 2018. Add some anticipated ad expansion from the stripped down fast-moving consumer goods marketers and Wieser makes a good case for being upbeat about the ad biz. "Perhaps the doom and gloom is helpful if it motivates practitioners to find ways to drive growth. However, if the industry is defined in an appropriately broad way, its efforts to add value to marketers should represent a solid basis for greater optimism." 1 comment about "GroupM Makes Case For Agency 'Optimism,' Says Ad Sector Needs To Be Redefined". Ed Papazian from Media Dynamics Inc, March 26, 2019 at 6 p.m. I realize that the data isn't readily available, but if digital ad revenues and attendant agency incomes were separated from those of the traditional media branding type the charts would probably show that the former---digital---is where the agencies made hay for a number of years---until enough clients wised up to reverse such gains---while branding activities remained fairly stable in terms of overall volume. Since the cat is out of the proverbial bag about digital media and the higher fees charged for handling such business coupled with lack of accountability, fraud, ad viewability issues etc., this is the main reason why the long term outlook mfor those agencies who prioritize and upgrade their service in the branding category is not as dim as some suppose. Clients are not going to take this function "in-house"---they simly can't rationalize the cost efficiency penalties of doing so nor the inbreeding of ideas and lack of general knowledge that this entails.